The Royal Wedding has made London the new hot spot. Tourist authority VisitBritain predict the wedding will trigger a major tourism boom pulling in an extra 4 million or so visitors in the next few years and some £2 billion in revenue. Meanwhile WhichBudget.com, the flight search engine, says it had a 194% increase in the total number of worldwide enquiries about flights to the UK in comparison with the same time last year. So will you join the throng and head to London? Has the Will and Kate factor worked its magic on you? If so here is our definitive guide to Prince William and Kate's (sorry we mean Catherine Duchess of Cambridge's) chic London. Gleaned from insiders, outsiders, minor aristocrats, hangers-on, party-goers, restauranteurs, hairdressers and everyone else who has gossiped about the royals, or celebrated with them over the past few days. 3. You'll find something similar to William's engagement suit at Turnbull & Asser. Prince William dresses in understated, upper-class style; buying suits and shirts from Turnbull & Asser (71-72 Jermyn St). Prince Charles shops here too. 4. John Lobb has been the official shoemaker to Royalty since 1863. If you have £2,000+ to spare for a pair of wing tips Lobb will make wooden copy of your feet and start the long process (waits of up to eight months have been known) of hand-making your special footwear. William, Harry, Charles, the Duke of Edinburgh and countless other royals have been Lobb-ed. The fifth generation of Lobbs (one of whom is also called William as it happens) now work at the bespoke shoemaker on St James Street, Westminster. Choose from various materials including crocodile skin, elk skin and deer skin. 6. Once you've done that of course you must visit the VERY aisle the dress swept down. A visit to Westminster Abbey, the place of the wedding, is a must for all lovers of pomp ceremony and tradition. The Abbey has crowned the royals since 1066 - a mind boggling statistic - and seen many a royal wedding including that of The Queen and Prince Philip but not Prince Charles and Princess Diana, who were of course married at St Pauls. 8. Now that the crowds have dispersed a view of the balcony which has suddenly become more romantic than Juliet's after that Double Kiss is a must, so go and visit Buckingham Palace. During the summer visitors can tour the nineteen state rooms which form the heart of the palace. The rooms are decorated with some of the greatest treasures from the Royal Collection, including paintings by Rembrandt, Rubens and Canaletto and sculpture by Canova. This year the rooms will be open from 23 July - 3 October. Entry is by timed ticket and demand is fierce. 11. Then head to to the Whistles branch on the king's Road where Kate Middleton shopped chain-store before the fashion designers of the world were beating a path to her door or pop into Jigsaw where she worked briefly as an accessories buyer during her short breakup with Will in 2007. 12. Not shopped out yet? Then head to Fenwick's, because the blue silk-jersey wrap dress by Issa that Kate wore at the couple's engagement announcement was bought off the rack at this department store in Bond Street. 13. Austique was opened by Australian sisters Lindy Lopes and Katie Canvin in 2004. The shop on the Kings Road is a favourite of Kate Middleton and her sister Pippa .When they want something a little less staid than royal garden parties demand they let loose with funky fashion labels from around the world as well as accessories and jewellery (330 Kings Rd). Austique also sells online. www.austique.co.uk. 14. 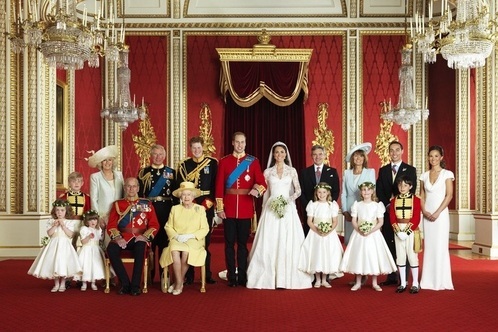 For more serious jewellery go to Garrard, the specialist in crown jewels (by Royal Appointment since 1843). Garrard at 24 Albemarle Street, Mayfair is where Diana's engagement ring (now Kate's) came from. Rumour has it Diana chose it because it was the largest on the tray. 15. Not to forget the men in all this - Polistas (the name is Argentine slang for 'polo players') is where you'll find the polo-clothes worn by William, Harry and Prince Charles. Canadian financier and polo pro Johnny Lynn launched his menswear line with the aim of aim out-Laurening Ralph. Soon all his polo-playing mates were wearing his three-pony logo (19 Shepherd Market or Westfield Central London). Tip for polo fans; find polo glamour in the middle of London at The Mini-Polo tournament in Hurlingham Park from the 3 - 5 June 2011. 17. Then belt across London and go for a drink at The Ship, a gastropub on the Thames. The Ship is a favourite drinking spot for Wills and his brother Harry and their friends. Apart from its patronage by young royals it is also known for good food and a decent wine list, not always true of the great British pub where warm beer the norm. The pub is pretty historic too- overlooking the Thames by the Wandsworth Bridge it has been there since it opened in 1786 as Thameside waterman's inn. 19. Tom's Kitchen is another Wills and Kate favourite.Tom Aikens is a popular celebrity chef and his main restaurant has Michelin stars and an equally starry clientele. Tom's Kitchen in Cale Street Chelsea, however, is more of a a neighbourhood place where people hang out and relax and amongst them Kate and her prince. Although William does prefer to head for the private dining room. (27 Cale St). To prove that Wills and Kate fever lives on, the Baglioni Hotel London is running a number of packages for royal lovers until the end of December 2011 which take guests to a number of the royal couple's favourite haunts, including some of those mentioned above. Packages also include limousine transfers, personal trainers and shoppers, candlelit dinners, tea in the Orangery at Kensington Palace and a number of other very special treats. Choose from the Prince William package (for men) , the Kate Middleton package (for women) or the William & Kate package (for lovers). The five star Baglioni Hotel London is an elegant Victorian building in Kensington, directly facing Hyde Park and Kensington Gardens. Luxuries include a Jaguar courtesy car service, SPA and the much-heralded Brunello gourmet restaurant.